Enjoy the best of oceanfront living from the stylish Baan Amandeha. This contemporary abode occupies a prime spot in the centre of Ao Yon Bay, one of the few coasts along the island where the waters are safe for swimming throughout the year. With a total of 10 bedrooms, this commodious villa welcomes 20 guests, so it’s just right for a large group getaway or family vacay with your entire clan. 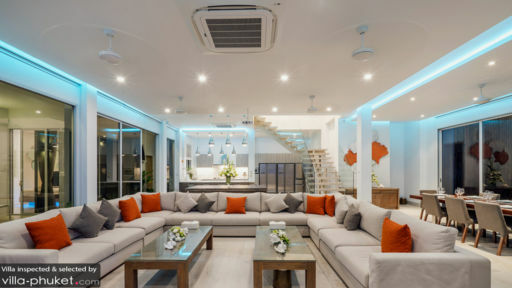 Outdoor exploration is a breezy affair when an abundant array of dining, shopping and nightlife establishments easily within reach; Phuket Town is located 10 -15 minutes away, Cape Panwa is a quick 5-minute ride away and the main shopping belts of the island are a 15-minute drive from the villa. 20 guests are accommodated in 10 bedrooms. White and off-white colours give the rooms a chic and elegant look, but the vibe is kept playful with colourful throw pillows, whimsical wall decor and under bed LED lights. Enjoy sweeping sea views from each of the rooms, along with amenities like private en suites and a terrace or balcony. The beautifully landscaped grounds at Baan Amandeha features towering palms, lush foliage, ornamental plants and a 200-year-old tamarind tree. Offering an incredible array of amenities, vacationers have much to see and do out in the spacious compound. Throwing a fun-filled pool party should be at the top of your list - the fully equipped outdoor bar comes fitted with fridges, a freezer, ice, wine coolers, pizza oven and barbecue grills. Chill out with friends by the 12-metre infinity pool, which features sunken seats and a jacuzzi tub, or lounge lazily upon the poolside recliners. Or walk right out to the beach from the garden for a day of coastal fun! Expansive floor-to-ceiling glass windows enable unobstructed views out to the beach and ocean. Ample light floods in through the glass panes, creating interiors that are bright and airy. Lofty ceilings add on to the sense of spaciousness within. The main living area is capacious, and features an indoor lounge, dining area, kitchen and bar. Baan Amandeha also enjoys a spa (equipped with an outdoor jacuzzi and chromotherapy lighting system! ), massage room and steam room. Call in the massage therapists so you can indulge in a full range of spa treatments - you deserve a pampering treat! Villa Baan Amandeha is a full service property with housekeeping services, personal guest services, laundry service, security services. A baby high chair and cot is available free of charge. Amenities available at additional cost include in-villa massages, airport transfers, personal driver services, car rental, boat rental, personal chef services and child minding services. 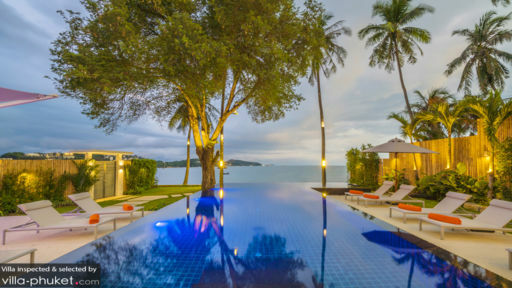 Villa Baan Amandeha is located in Cape Panwa, southeast Phuket. The serene, laid back atmosphere at this part of the island will suit villa vacationers seeking a restful getaway. While the area doesn’t offer much in terms of travel attractions or nightlife, you’re located within easy reach to the beach, restaurants, offshore islands and spas. Spend the day at Ao Yon Beach or Panwa Beach; unlike the beaches in West Phuket, the coasts are free of the tourist crowds. Ao Yon Beach offers a postcard-perfect setting with its fine white sand, palm-fringed shores and glimmering waters, while Panwa Beach boasts uninterrupted vistas out to Chalong Bay and Lone Island. Away from the beach, enjoy incredible spa rituals at Amatara Wellness Resort’s Thai hammam spa, experience the vibrant nightlife scene of Phuket Town, browse through myriad souvenir and street food stalls at the weekend markets of Phuket Town or hop on a speedboat for an offshore adventure. Located a 15-minute speedboat ride away are Lone Island and Coral Island; the former is ideal for a relaxed day trip, while the latter offers excellent scuba diving, sea-walking and parasailing. Take your pick from restaurants like Top of the Reef, an elegant grill room with views of the Andaman Sea, Lainapa Restaurant, a beachfront venue with live jazz performances, Live India Indian Restaurant, a casual eatery with delicious Indian fare and Panwa House Phuket, a beachfront venue ideal for romantic dinners. I can honestly say that our time in Phuket was even more special than we ever could have hoped or planned for. We spent a good amount of time trying to find the right place that could fit our large group of 24 people comfortably. The villa is situated in the most perfect location on the island. The sun rises over the hills across the bay that the villa faces. We made a habit of waking up every morning to watch the sunrise in or around the pool. It was the perfect start to the day. Speaking of the pool area, it was perfect for a group our size. There is more than enough lounge area, and the water is always clean, sparkling, and the perfect temperature. The beach just off the property is perfect for swimming as well. Because the bay is so calm it made for perfect swimming conditions pretty much every day we were there. As far as both villas go the accommodations are top notch. The houses are planned so well, and the architecture is stunning. Everything you could need for your trip is provided. There was more than enough space for our large group. The pool table and ping pong table allowed for hours of competitive fun for our group. The communal area and dining table worked great for us.I would recommend staying at Villa Baan Amendeha to anyone who would like to have more than just a trip, but a complete experience in Phuket. When we go back I couldn’t imagine staying anywhere else. Staying at Villa Baan Amandeha was an absolute dream. The chef cooked amazing meals for us all week, the staff were fun and kept our house in order. If I needed transportation it was there in 5 minutes. All the rooms are large and well equipped with everything you could need. The beds are comfortable, and the open concept living area is the perfect spot to hang out with friends as you watch the sun set on the beach outside your door. We spent a ton of time in the pool, playing ping-pong, and having drinks at the outdoor bar. The location of the villa is ideal. I would recommend this villa to anyone looking for a luxury stay in Phuket. It had everything I could have asked for in a villa. They had to kick me out at the end of the week!